Viewing 5 current events matching “diy” by Date. Viewing 74 past events matching “diy” by Date. This is a group of DIY'ers who are interested in book scanning machines, typically creating them and scanning with them. At least three members of our group have built book scanners with the help of http://diybookscanner.org/. Come learn about ongoing projects and how you can help your community by supporting digital books! I just ran into these guys with a makerbot set up at my local coffee shop. They're on a driving tour, evangelizing 3-d printers for personal manufacturing, and will be at BackSpace tomorrow to demo their printers and show people what they can make. Curious about the process of integrating electronics into fabric? Have something at home that lacks some much needed illumination? This workshop is a great place to start! LEARN: * How to create a circuit with up to two switches * Methods of sewing circuits on to your fabric using conductive thread. * How to convert standard LEDs (and other electronic components) into sew-able ones * How to use standard textile fastenings like zippers and snaps to switch your project on and off, *Lots of tips on how to make your project easier and make sure it lasts. Cost: $5 covers basic materials with a suggested $5 - $10 pay what you can for the workshop lessons. Join us for another edition of introductory lessons into the world of soft circuits! Who: Anyone 21+ years old, who wants to learn how to add an LED and switch to an article of clothing, stuffed animal, or fabric based accessory. All skill levels of sewing and electronics are welcome! non-conductive cotton or polyester thread that coordinates with your fabric. Jun 28, 2014 Skull Light at Lovecraft! Learn to sew your own plush skull that lights up when you squeeze it! Who: Anyone 21+ years old, who is interested in learning how to combine sewing and electronics. All experience levels welcome! 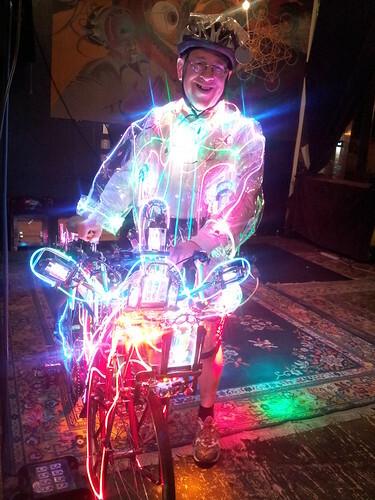 Interested in making awesome things with electronics? Or, just talking about electronics? Or, listening to other people talk about electronics? Then our monthly meetup is for you. See more at the website. Oct 25, 2014 DIY Light Up Monster Workshop at Lovecraft! Learn to sew your own plush monster that lights up! EAST Knowledge is pleased to announce it's fourth meeting. Pat Nystrom will be giving demonstrations on his efforts to make it easier to prototype electronics at home. All are welcome! Solder masks are used in electronics manufacturing both to protect copper traces and to keep solder from going where it shouldn't. Pick and place machines are devices used in electronics manufacturing. They come in various sizes, but they are commonly expensive. Pat is working on something that would be suitable and affordable for enthusiasts or prototype manufacturing. This workshop is a hands-on introduction to the Cypress PSoC device family and the (free) PSoC Creator Integrated Development Environment(IDE). The workshop will include a brief architecture and software/IDE overview, followed by hand's-on project labs. Prerequisites: Basic electronics (the ability to understand a schematic drawing). Basic programming helpful. Workshop Attendees will receive a PSoC development kit (CY8CKIT-049) that includes a flexible USB-UART device, and a PSoC-4 device. Light refreshments provided. • Programmers who would like to learn more about hardware and debugging. • Hackers who would like to learn new skills for quickly solving hardware problems. • Students who want explore and learn about new hardware-based solutions. This workshop is the first in a series presented by PDXElectroHax and PatternAgents using programmable hardware and systems. If you have wanted to learn more about using programmable hardware, like Field Programmable Gate Arrays, Programmable System on Chip devices, Programmable Logic Devices and more; in a easy-paced, hand's-on environment, then this is the workshop series for you. Applications include lighting, motor/motion control, sensor monitoring and more. Listened to Depeche Mode, Yes, Peter Gabriel, Vangelis, Tangerine Dream, Paul McCartney, or Talking Heads, then you've heard music from sampling keyboard equipment he helped to design. Watched cartoons from the animators at Hanna-Barbera Productions (Flintstones, etc. ), then you've seen images processed from digital image processing equipment he helped to design. Seen pictures from the Voyager spacecraft, then you've seen images processed from digital image processing equipment he helped to design. Tom has over thirty years of engineering experience, and has designed systems and integrated circuits for client companies including Cray Research, Adobe Systems, Hewlett Packard, Silicon Graphics, Rohm, Hyundai Electronics, Emu Systems, and many others. Learn how to create a computer controlled wood mill using parts harvested from recycled electronics. Interested in Making a Smart Sneaker for OMSI Maker Faire Portland?